Warburn Estate is a large wine producer who sell a lot of their products through the Woolworths/Dan Murphys chains here. Woolworths are on of the two major supermarket chains in Australia, the other being Coles. In this case the wines were made available exclusively from Woolworths stores. Generally the Warburn Estate wines retail for around the $10 mark. 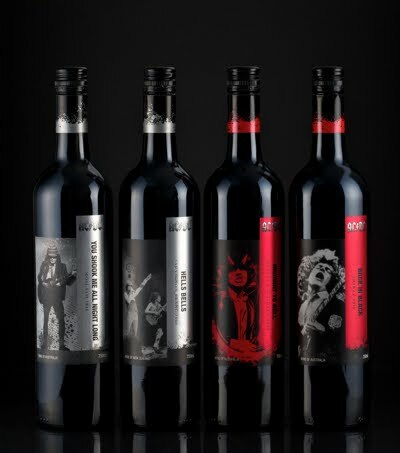 All four of the AC/DC range retail at $15.99 which I think is a clever strategy that I’m guessing the aim is for consumers to not be swayed by price to purchase one wine over the others. in fact due to the price and style of wines they made I think the average accadacca fan will at least buy one bottle of each but most likely several. The closest Dan Murphys store to me is about 25 minutes drive away and I went in there a couple of days ago to grab a bottle of each of the reds. SOLD OUT!! Wow, I was impressed. They had a few bottles left of the Moscato (sweeter slightly fizzy white) but that didn’t interest me. When I asked the store attendant if they got much of it in stock to begin with, he told me they had about a pallet, which equates to roughly 50-60 dozen depending on how they were packed. these wines by the way were packed in 6 bottle boxes, again I give some kudos here to the producers as I think many would buy a 6 bottle box given the chance but probably wouldn’t buy a dozen box. The impressive thing about all of this is that it means the wine sold out in approximately 3 weeks! Now I’m not sure if there are plans to do a follow-up release but I hope that they do as it really does help pave the way for myself and our ambitions. Luckily I went past another store later in the day and I did manage to get a bottle of both the Cabernet and the Shiraz. I tried the Shiraz that night and while I don’t like tasting notes, here are my thoughts on it. Purple and vibrant, this has all the hall marks of what young Shiraz should look like. There is a good, yet simple ripe berry aroma and it seems as if somebody may have walked past the tank with an oak stave at some point, but lets just say there isn’t a lot of complexity going on here. The palate is medium bodied and quite smooth, overall it is a pleasant drinking wine. Basically, the wine was pretty much how I expected it to be. Good wine for the price and considering it is pretty young being a 2010, there were some good qualities about it. I’m yet to open the Cabernet but i will in the next week or so and give a little update then of my thoughts.